The sun is going down behind us and no land is in sight. 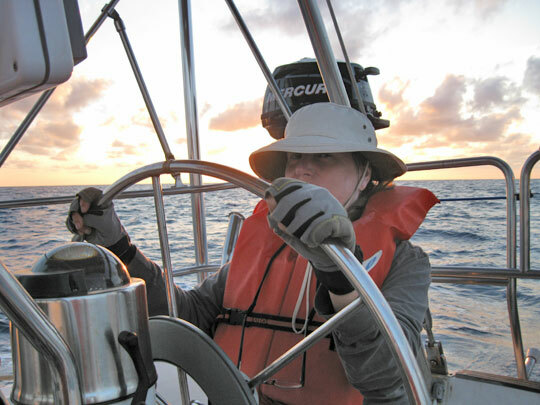 Wednesday we left our Miami anchorage at 7:00am to sail for Bimini. We had an easy trip out the inlet under a light breeze. Out by the ‘M’ Miami buoy we set our GPS positions and raised sails. By then the wind was coming from East-South-East at 10-15 knots. At first I used the distinctive buildings by the inlet and the Key Biscayne light house as landmarks to check our position every half hour. This became less reliable the further east we progressed. After we hit the strong North-bound Gulf Stream it appeared that we were being dragged backwards at times. At Duwan’s suggestion we started trusting the latitude and longitude on the GPS to find our position. The wind died out for a while and we motor-sailed. It picked up again around 2:00pm and we made some more progress. As long as we were in the grips of the Gulf Stream, though, our progress eastward was minimal. As the sun went down we found ourselves just over half-way. The Gulf Stream current eventually abated. Duwan hunkered down at the wheel and I kept watch as we motored East. The GPS guided us straight to Nixon’s anchorage below South Bimini around midnight. We still had a strong breeze. We also had a strong tidal current. We passed the large rock at the entrance to Nixon’s and slowly motored around in the dark empty anchorage looking for a spot to drop the hook. After finding something I thought was suitable I looked down to put on some gloves. I heard Duwan say “What’s that?!”. In just a few seconds we had been dragged back toward the big rock. It was looming there like the iceberg waiting for the Titanic. Duwan gunned the engine and steered out toward deeper water where we dropped anchor. The bottom at Nixon’s is hard and we dragged for a while before I felt the anchor grab hold. I paid out all our long chain and a lot of rode to boot. We noted the position of the nearest flashing lights so I could check later to make sure we weren’t dragging again. We almost felt like we were in Bimini. At sunrise we saw that we were not even in the anchorage. In the dark we had ended up anchoring scarily close to the big rock. Oh well, at least the anchor held. 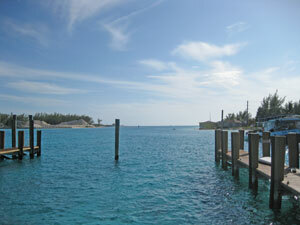 View of the Bimini inlet from our slip. 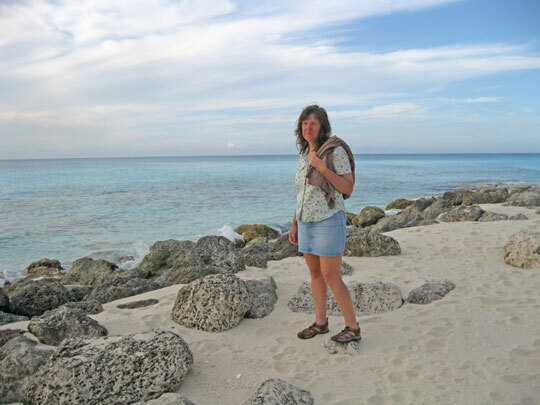 Late in the morning we motored up to the harbor entrance between North and South Bimini. It is shallow and the channel markers here aren’t reliable. We waited and watched as a container boat came through, then we went in following the path it took. When we got through the sphincter-tighteningly shallow entrance a big motor boat behind us honked, saying they wanted to pass. I apologized for holding them up, but the captain said he was following our track to make sure he had enough depth. The new manager’s of Brown’s Marina (Mike and Amy) were standing at the docks. After we had a quick conversation from the boat Duwan guided Blue Wing smoothly into a slip where we had folks volunteering to help us tie up. Pelicans on pilings at Brown's Marina. We filled out all the forms. I walked to Customs and secured a six month pass. Immigration was on a Bahamas schedule, though. The office door said to knock before entering. The door was locked. I waited a while, chatting with some other new arrivals. I ended up walking a half mile to the admin building where there was another Immigration officer. When I came back by the first office the door was open and there was an officer resting face down on the counter. Back at the boat we lowered our yellow quarantine flag and raised our Bahamas courtesy flag. We are here! Duwan on the beach in Bimini. 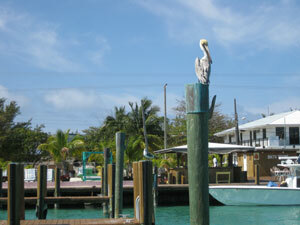 This entry was posted in Bimini, Life on the Water, Passage, The Bahamas. Bookmark the permalink. Congrats! This is all so impressive. So many boat words that I don’t understand at all… sailing sounds hard. A year from now you’ll look back at this trip and laugh at the inexperience. WOW! Captain Greg.. Fantastic. LOVE the blog. I am so impressed. Thanks for doing this blog. It gives us cube dwellers hope! I can’t wait to get my boat out this spring. Truly an inspiration what I see you and Duwann doing and going for it. Sweet. Still waiting for the phone to be tossed in the deepest part story. Be safe and sounds like you are having a wonderful time. Love the post and congrats on the safe sail there. I hope you have a wonderful time and I can’t wait to read about more of the adventure!